Easily grown in average, dry to medium moisture, well-drained soils in full sun to part shade. Best with consistent moisture, but has some tolerance for drought. Plants generally tolerate a wide variety of soils as long as drainage is good. Plant tubers in the garden after last spring frost date or in fall after first frost has occurred. Best to site plants in locations sheltered from strong winds. Removal of browned and tattered seed heads, foliage and plant stalks from the garden after bloom may improve the appearance of the landscape, but may simultaneously disappoint local song bird populations (particularly finches) which love to feed on the seeds. If the plants must be cut down, consider saving the seed heads for feeding the birds in winter. Plants will spread in the garden, sometimes invasively, by rhizomes and self-seeding to form colonies. Once planted in garden areas, they are difficult to remove from the garden. Tiny pieces of tuber left in the soils will sprout. Plants are best sited in areas where spread into other valuable plantings will not occur. When spring plants reach about 1’ tall, mulch may be applied for purposes of helping retain soil moisture. Helianthus tuberosus, commonly called Jerusalem artichoke, sunchoke or sunroot, is a type of sunflower which is native to old fields, moist thickets, forest margins, streambanks, railroads, road margins and open places in North America. Original native territory is difficult to determine but probably extends from Newfoundland to Saskatchewan south to Georgia, Tennessee and Arkansas, however plants have naturalized over time throughout the entire U.S. and are currently found in all states except Arizona, New Mexico, Nevada, Alaska and Hawaii. This plant is ornamentally grown in landscapes for its attractive late summer to fall sunflowers and/or in vegetable gardens for its knobby edible tubers which are produced below-ground on white rhizomes. Tubers purportedly have an artichoke-like taste. 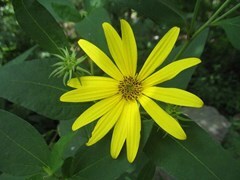 Jerusalem artichoke and common sunflower are both members of the same genus Helianthus within the composite family. Both produce showy yellow sunflowers on tall stems. This plant features rough-hairy (often branched near the top) stems which rise to 6-10’ tall bearing rough, ovate, serrate-dentate leaves (4-8” long along main stem) on winged petioles. Lower leaves are typically opposite but upper leaves are typically alternate. Numerous yellow sunflowers (to 2-4” across) bloom in August-September. Each flower has 12 to 20 showy, petal-like, bright yellow rays (each to 1 1/2” long) surrounding a yellow center disk (to 1” diameter) of tiny darker yellow disk florets. Fertile disk florets give way to achenes (seeds to 1/4” long). Jerusalem artichoke is typically weedy and invasive. Once planted in the landscape, it is usually difficult to remove, and typically spreads to form colonies. Jerusalem artichoke was an important food plant for native Americans for many years prior to 1600. The French explorer Samuel de Champlain reportedly found this plant growing at Cape Cod in 1605. Tubers were brought back to Europe where they were widely planted, with the tubers becoming a common vegetable food crop in a number of areas by 1650. Plants are still grown today for harvest of the tubers which begins about 2 weeks after the flowers fade. Each plant typically produces 2-5 pounds of tubers per year. Raw tubers have a nutty flavor. Tubers may be grated raw into salads, boiled and/or mashed somewhat like potatoes, roasted or added to soups. Unlike potatoes, tubers do not contain starch. They do contain inulin which converts into fructose which is better tolerated by people with type 2 diabetes than sucrose. Genus name comes from the Greek words helios meaning sun and anthos meaning flower. Specific epithet from Latin means tuberous in obvious reference to the edible underground tubers. Notwithstanding its common name, however, Jerusalem artichoke is not a type of artichoke (thistle-like plant). Moreover, it is native to North America with no connection to the city of Jerusalem in Israel. Jerusalem artichoke probably comes from the Italian name for this plant, girasole articiocco, which means sunflower artichoke in reference to flower appearance and tuber taste, with Jerusalem probably being a mispronunciation of girasole. Rust, leaf fungal spots and powdery mildew are somewhat common. Caterpillars and beetles often chew on the foliage. May need staking, particularly if grown in exposed locations. Small groups or mass. Borders, vegetable gardens, cottage gardens, bird gardens, butterfly gardens, wildflower or native plant gardens, and meadows. Will thrive in sunny areas. Due to tall size and invasive tendencies, this plant is perhaps best sited in naturalized areas or rear corners of perennial borders/vegetable gardens where it can spread to form colonies. It is generally considered to be an inappropriate selection for formal borders. Butterflies love the flowers. Some songbirds love to eat plant seeds directly from the seedheads.